Spacious, Upgraded StoneRidge Sage Plan with Breathtaking Views + Casita with private entrance that may be used as a fourth bedroom! Nice single level home with three bedrooms, three- and one-half baths and three car garage. The kitchen features hardwood staggered cabinetry, a granite island, glass front cabinets, and slide-out shelves as well as a dining area. Ceiling fan in the great room, which sports eighteen-inch tile flooring, along with a great view! The master suite offers a bay window sitting area. Sunshine flows through windows, and in the bath, you'll find an executive height counter with dual sinks, and a glass enclosed shower. Soaking Bath, Heat Lamp, Hardwood Cabinets w/Pulls, Large Walk in Closet & Private Toilet Rm. 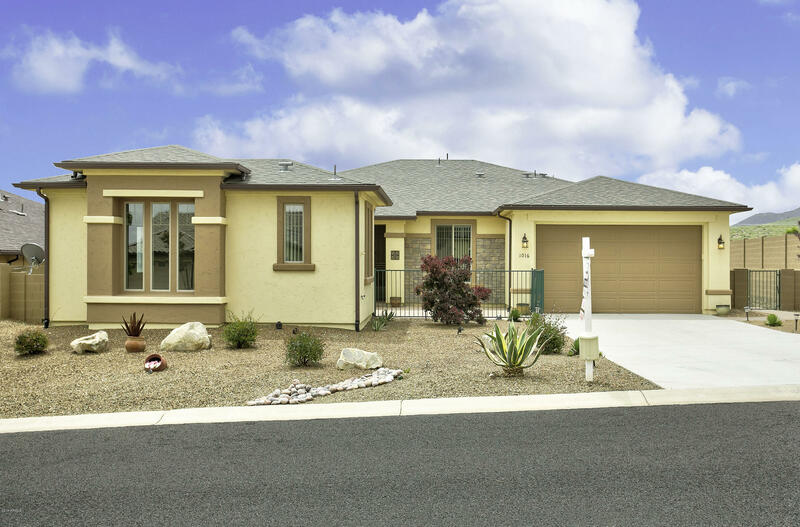 Roomy Private Casita w/Gated Front Paver Courtyard, Exterior & Interior Entrances. 18" Tiled flooring, Lighted Ceiling Fan, Fresh Paint, Mini Kitchen Set up w/Sink & Counter, Sliding Door closet, Linen & Coat Closet, Private Bath w/Granite Counter, Clear Glass Step in Shower & Elongated Toilet. Amazing Pro-Landscaped Easy Care Yards w/Drip Watering System., Assorted Native Cactus, Block & Iron View Fencing, Extended Rear Yard Covered Paver Patio, BBQ Area w/Gas Hook-up, Panoramic Open Views of Rolling Hills, Bradshaw Mountains, Mingus Mountain & City Lights! Imagine Entertaining Under the Stars! Additional Upgrades include, Brushed Nickel Fixtures, Stacked Washer & Dryer, 6 Panel Doors, 8' Tall Garage Door w/Keyless Entry System, Garage Window, Insulated Garage Door, 2x6 Framing, 50 Gallon Water Heater w/Hot Water Re-circulation, Low E Vinyl Windows, Outdoor Recessed Lighting, French Doors, Garage Shelving & More! Hurry this Home won't last.